Interested In Having Your Own Concierge Business? Do you fit the concierge personality? If so, personal and corporate clients may stand in line to hire you to assist with everyday tasks that they must, but cannot, perform. Americans work harder than ever and, as a result, more people willingly pay for personal services that will help make their lives easier. This translates into an incredible opportunity for you. What Is A Concierge Personality? A concierge personality is part Houdini and part Merlin: a good concierge makes the impossible happen!!! Blend these magical, mystical skills with……. An organized, comprehensive manual, CONCIERGE IN A BOX™ details how to start your own concierge business. 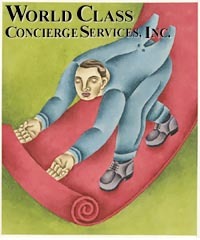 This breakthrough guide contains the best-kept secrets on how to succeed as a concierge. Along with this comprehensive, recently updated, manual you will receive one hour of telephone support to help you with any questions you may have regarding how to start a concierge business. We have designed the handbook in a three-ring-binder format so you may add your own information as required. cutting edge manual, call 1-800-863-5727. Twenty-four hours a day. Seven days a week.